PulauPulau.com offers a wide range of holiday packages, day tours, transfer, room reservations with online secured bookings. The Perhentian Island group of islands are the northernmost islands off the east coast of Peninsular Malaysia. Lang Tengah Island off the coast of Terengganu is one of the nation's well-kept secrets. From a sleepy fishing village, Redand Island has grown into one of the most popular tourist destinations on the east coast of Peninsular Malaysia. Pulau Tenggol is another beautiful diving getaway and lies just 45 minutes off Kuala Dungun in the south of Terengganu. It is small - just 3km long and 2km wide. An island known only to a few, Gemia Island covers about 9 acres and its closest neighbour is Pulau Kapas. Pulau Pemanggil is about 1 hours away by boat from Mersing. Considered one of the most beautiful islands in the world, Tioman is the largest and most developed of the volcanic islands that make up the Pahang Marine Parks. Located 8 km off Mersing, Pulau Besar (literally means "big island") is one of the closest islands to the Malay Peninsula. Pulau Sibu is a pleasant hideaway with its lush tropical vegetation, endless stretches of golden beaches and clear blue waters. 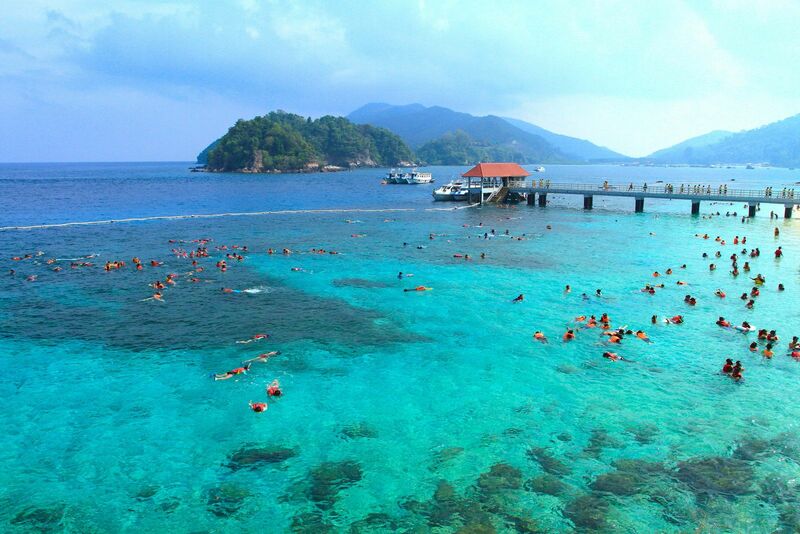 Tinggi Island or Pulau Tinggi is one of the many captivating tropical islands that nestle the East Coast of Johor. The island off Mersing, along with Pulau Dayang, Pulau Lang and Pulau Pinang, are rated among the best diving destinations within the Johor Marine Park Area. Located 65 km off Mersing on the northeast coast of Johor. Dayang Island is West Malaysia's furthest and most unique paradise out in the South China Sea. Untouched and unspoiled, surrounded by crystal clear blue water or striking beauty and remarkable marine resources. Located approximately three nautical miles off Pengkalan Pernu in Umbai, 10 km south of Melaka town, is Pulau Besar. Pangkor Island, the most popular holiday destination in Perak, welcomes visitors with its serene golden beaches, crystalline blue waters and cool refreshing breeze. Langkawi is an ancient group of islands located on the north-western shore of Peninsular Malaysia. Pulau Jerejak gained its alias as The Alcatraz of Malaysia, because of the Jerejak Prison. Located towards the south eastern tip of Penang Main Island, this 362ha island is rich with history, flora and fauna. The reefs lie in shallow waters with little current making it an ideal location for novice divers, however, the diverse and sometimes rare marine creatures also make it an interesting dive location for experienced divers and underwater photographers. Lankayan Island is a virtually uninhabited island located in the Sulu Sea. This tiny island is covered by thick tropical jungle that is surrounded by smooth, white sand - the perfect getaway. Pulau Tiga is the largest of the three islands that make up Pulau Tiga Park. Its beautiful landscape and unspoilt natural environment has attracted CBS TV Network of the USA to use this island as the main location for the popular ‘Survivor’ Programme, dubbing it the ‘Survivor Island’. With its sparkling white sand, mesmerizing blue waters and top-class resort, Mataking Island is the ideal getaway for both the avid diver and non-diver. An hours boat ride from mainland Borneo, Pom Pom Island is a pristine, private island with sun kissed sandy beaches surrounded by the deep azure of the Celebes sea. Mabul Island is reputed to be one of the best places for underwater macrophotography in the world. Located in the clear waters of the Celebes Sea off the mainland of Sabah, it is surrounded by gentle sloping reefs two to 40m deep. Kapalai island - The mere name conjures the image of crystal clear waters and a floating paradise like no other. A 45-minute trip from Semporna by speedboat, Kapalai island is one of the many beautiful diving havens in this part of the world. However, Kapalai is truly unique because it is not quite an ‘island’. Mantanani Island is a group of three isolated islands northwest of Kota Belud, a one-hour drive from Kota Kinabalu. Until recently, the islands were only known to a few locals. The largest island houses the only dive resort, Mantanani Resort which is situated at the western end on the edge of a white sandy bay. The corals are definitely healthy and teeming with marine fishes. Among the stony corals you could even spot a number of Bennet's feather of star as well as rare bulb tentacle anemones. This is one of the quieter of the national park's five. People generally visit for the day and only a few people stay overnight - the accommodation is limited and the facilities pretty basic. But they do a tasty barbecue. The little land mass supports a luxurious 90-room dive resort, a Malaysian Naval base and a nesting colony for several sea-faring migratory birds. The reef topography is essentially made up of a rich growth of hard corals; some so shallow that they break the sea surface during low tides, but most begin at depths of about 5m right down to the ocean floor. The Rebak Island, named after the native Rebak tree,is one of the 99 isles that make up the legendary Langkawi. The island is blessed with a balmy climate, stunning rock formations, a lush forest that goes back a million years and pristine, secluded beaches. A part of nature with jungles and forest as old as 100 million years.